Man of Steel is a Nolan-ized retelling of the Superman origin story. In this version, Kryptonians were explorers and colonizers, forming communities on many planets. But in using up all their resources they doomed their planet to extinction. As in previous versions, pre-eminent scientist Jor-El sends his only son, Kal-El, to a planet far away, where he can live. His antagonist, General Zod, in this story is not evil. He’s just a pragmatist who wants to defend his people and their way of life. Thing is, Jor-El knows that Zod’s way is not the best way. Now here’s where it gets confusing. Remember Batman Begins? How we intercut the present day with Bruce Wayne’s training? Well, that happens in Man of Steel as well. In one track, you have Clark Kent (Kal-El) growing up in Kansas and learning what it means to be a person; in one you have Clark traveling around Canada and other northern areas, learning about himself and saving people here and there; and in the main one you have the battle between Kal-El and Zod. The main plot of the film is basically this: when Krypton exploded, Zod and his people were freed from the Phantom Zone (their prison, sentenced there for 300 years) and spent more than 30 years seeking other Kryptonians. A chance encounter Kal-El has with a Kryptonian ship brings Zod to Earth, showing humanity that they are not alone in the universe. Zod’s plan isn’t even an evil one — he just wants to re-create the Kryptonian people. Problem is, Kal-El has grown up as a human named Clark Kent, and he won’t allow Zod to build his new empire at the expense of trillions of humans. Man of Steel (a phrase that’s never used in the film, by the way) stars Henry Cavill (The Tudors) as Clark Kent/Kal-El/Superman. I remember reading articles, back when he was announced, that a British man couldn’t play the iconic role. Well, other than a bit too much chest hair peeking out the top of the super-suit, I can confidently say that I totally bought Cavill in almost every aspect. He’s not Christopher Reeve… but then, Daniel Craig isn’t Sean Connery, either. Cavill has a strong delivery without sounding smarmy or fake, and he certainly looks the part. I completely bought Kevin Costner as Jonathan Kent. He’s a little rougher than John Schneider (Smallville), but I was totally on board. More so with him than with Diane Lane as Martha. Russell Crowe was a worthy successor to Marlon Brando. Plus, having had more recent experience in action-related roles, he could be more active. Michael Shannon (Boardwalk Empire) had the look of Zod down pat — a younger, more militaristic Zod, which cannot be compared to Terence Stamp’s seminal version or even Callum Blue’s “young Zod” — but I just didn’t like his voice. I would’ve liked him to work with a voice coach before taking the role. He was the only Kryptonian who didn’t sound well-spoken. Antje Traue (Pandemonium) brought a truly menacing villainous presence to the screen as Faora, Zod’s second. Her character was quite one-dimensional, as was Ursa in Superman II, but I bought into her. Laurence Fishburne as Perry White was an interesting choice, but it felt more like stunt casting than anything else. Amy Adams (who I can’t believe is almost 40 already) pretty much exemplified everything I don’t like about Lois Lane. She’s the everywoman through whose eyes we see Superman, just like usual, and as with Erica Durance she has plenty of agency, but I just don’t like the character. I think it’s because I’ve been a reporter, and no reporter I know (and I know a lot) are anything like Lois Lane. Not even the award-winning ones. Zack Snyder’s direction was often frenetic, using all the Nolan trademark shots. Having seen 300, it’s easy to see where Snyder’s style comes from… but in Watchmen, his style was quite different, without all the shaky-cams and snap-pans. Even the fight scenes in that film were better — in this one, it’s just people blurring past and stuff blowing up everywhere. His non-action direction was fine, though. I will say that I’m getting a bit tired of Hans Zimmer. The music was powerful throughout, soft where it needed to be, but as with Michael Giacchino’s Star Trek scores, I didn’t feel that the theme reached a strong crescendo. It just kept building and building and building and… and then the movie ended. I think it’s time for Nolan to find a new composer; I recommend Ilan Eshkeri. One other note — the product placement was blatant throughout the film. Nikon, Sears, 7-Eleven, IHOP, and Nokia got a LOT of play — including the latest version of the iconic Nokia ringtone. It wasn’t quite as bad as the (probably intentionally) ham-handed way they do it on Warehouse 13, but it was noticeable. I think that, overall, while the movie was enjoyable, it was just too much. Not the destruction of Krypton, but the battle between Kal-El and Zod (and Faora and the other soldiers). The destruction and devastation is just way too widespread. Shortly after the climactic battle began, I started tuning out what was going on. I couldn’t really make out any details once Kal-el and the others just kept flying all over the place. Maybe younger people than me can keep up; maybe this is the way action filmmakers keep us from noticing details. But in The Avengers, I was at least able to follow the battle with the Chitauri in New York City, and I bought how much destruction happened from that. This? It was just too much. 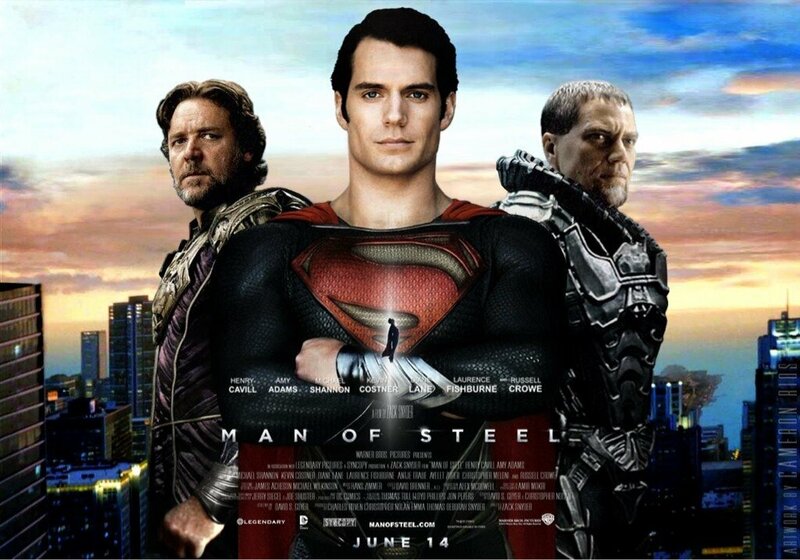 As with Star Trek Into Darkness, the farther you get from seeing Man of Steel, the more you notice its flaws. It was a flawed film, but a decent one. Don’t waste your money on 3-D, and try not to go at night so you can save a few bucks. I’ll be interested to see where the Nolanverse takes the Superman character. Note to Parents: This film contains a LOT of violence, as well as widespread destruction. There’s not a lot of swearing, and there are no sexual situations. There is, however, a naked baby, so expect younger children to laugh inappropriately at that. There’s also a scene of childbirth, but it’s not graphic. Use your own best judgment before letting your children see this movie.